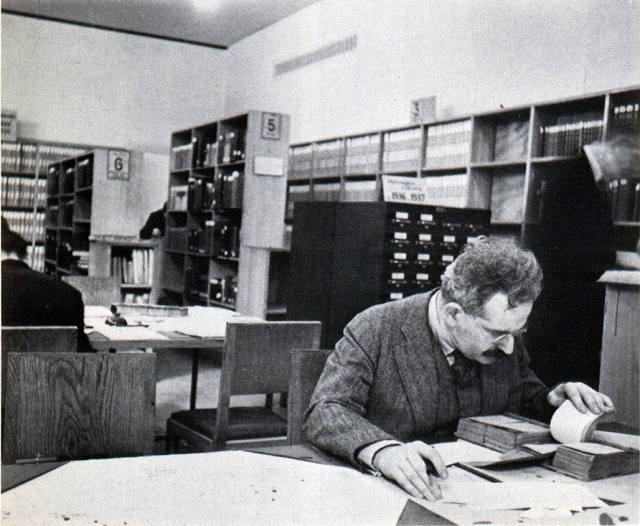 As a critical theorist and revolutionary, Walter Benjamin sought the political transformation of the arts as a means to bring about social change. In the fifth of an eight-part series, Andrew Robinson discusses Benjamin's work on cultural politics, covering the topics of Surrealism, storytelling and cultural production. In a paper on Surrealism written in 1929, Benjamin argues for a particular approach to revolutionary art. This argument is based on the idea that practices of transformation and montage are central to the ‘politicisation of art’. Breton in particular is depicted as the first person to see the revolutionary potential of ruins and the ‘outmoded’ (or unfashionable). He saw architectural and social poverty, and ‘enslaved and enslaving objects’, as able to be transformed into revolutionary nihilism, creating an atmosphere ripe for explosion. The way to perform this transformation is to treat the past politically instead of historically. For Benjamin, this is the latest in a series of cases where the avant-garde have played ‘transformation games’ with images and words, creating magical formulae and slogans. Surrealism is seen as a rebellion against a ‘left-wing bourgeois’ position in the European ‘intelligentsia’ or intellectual elite, as well as a rebellion against Catholicism. Surrealism is directed against a certain kind of sentimental ethical activism based on ‘idealist morality’. Instead of a humanist position, they portray a constantly ringing alarm-clock. Benjamin praises the Surrealists for reviving a radical concept of freedom he likens to Bakunin’s, and calling for unrenunciated enjoyment. He criticises them for lacking the other side of Bolshevik revolution, the disciplinary or preparatory side. Without this side of revolution, Benjamin sees us as limited to ‘fitness exercises’ and ‘celebration in advance’. (In his early works, Benjamin is very much a Bolshevik). But he also sees the Surrealists as seeking to win the ‘energies of intoxication’ for the Marxist revolution. Benjamin also discusses ‘illumination’ in this work. He argues that a special kind of ‘profane illumination’ exists, which comes neither from religion nor drugs. Love, art, and alternative lifestyles all provide sources of such illumination. So do flânerie, loitering, reading and thinking. Elsewhere, in ‘Paris: Capital of the Nineteenth Century’, Benjamin uses another term for a similar phenomenon: the ‘dialectical image’. This type of image is necessary to experience the messianic aspects of history. It uses dreamlike elements in waking life, often acting as a prefiguration of the future or a call to wakefulness to real conditions. But the commodity itself provides a variety of dialectical image, the fetish. This might imply that radicals need similarly or more powerful images to counteract the power or mana of the fetish. The ‘bourgeois’ parties (including the social-democrats) are criticised for a poetic politics which is like ‘a bad poem on springtime, filled to bursting with metaphors’. Their politics lacks the kind of illumination or intoxication Benjamin seeks. They offer images and equivalents (to live ‘as if’ one were wealthy or free), and lots of optimism. In contrast, Benjamin sees Surrealism as offering a properly communist pessimism and mistrust. Moral metaphor should be expelled from politics, and replaced by images – but not images for contemplation; rather, images which are bound-up with action. In ‘The Story-Teller’, focused on the work of Nicolai Leskov, Benjamin provides an account of storytelling as a practice distinct from novels and literature. Benjamin sees storytelling as a dying form. Storytelling has its roots in experience transmitted from mouth to mouth. There are, Benjamin suggests, at least two types: the travelling storyteller who brings stories from afar, and the local who knows the tales and traditions of a locality. It is a craft rather than an art. It is always rooted in the people. Stories contain something useful for the reader, such as a proverb, a moral or a practical tip. They ‘counsel’ the reader. (Proverbs in particular are ‘ideograms’ of stories, conjuring memories of a story in a short phrase). Counsel is really a proposal to continue the story. There are many gradations or layers of stories, expressing layers of experience. According to Benjamin, a good storyteller operates as if moving up and down a ladder which extends downwards into the earth and upwards into the clouds. This ladder expresses a particular collective experience which is immune to individual shocks and deaths. Stories even seem to speak with the voice of nature. Stories are meant to be re-told. As a result, there is an accumulation of different layers of reception in each telling. The listener’s interest in retaining the story – the importance of memory – is central to storytelling. Memory creates a chain of tradition passing between generations. It creates a web or net which ties the various stories together. A storyteller is a sage or teacher who can draw on entire lifetimes of experiences. Their ultimate authority, Benjamin suggests, is borrowed from death, and refers back to history. In contrast to historians, who seek to explain events, storytellers or chroniclers turn them into models. The storyteller is a secularised version of the chronicler, who keeps faith with the dream-time in which humanity and nature are in harmony. Benjamin links storytelling to the life of artisans. It does not try to convey the essence of a thing, but rather, to sink the thing into life and draw it out again. This world is being lost, because work in modernity is abbreviated. Products of ‘sustained, sacrificing effort are vanishing’. Storytellers use their hands as well as their voices, relating to their material – human life – as artisans do. Stories, in contrast to news reports, do not impose an interpretation on the reader. Storytellers usually forego psychological aspects in their presentation. The reader, rather, assimilates the story by adding such shading subjectively. This requires a state of relaxation which is also becoming rare today. The gift for listening is being lost. Benjamin writes of fairy-tales as early means to escape the fatalism imposed by myths. Fairy-tales teach us to meet fatalistic, mythical forces ‘with cunning and with high spirits’. These stories connect nature with liberated humanity, instead of with mythical forces. Stories also often express sympathy with rascals and crooks. Storytelling is dying because the value of experience has decreased. Wisdom, which Benjamin terms the epic side of truth, is dying out. The loss of listening impacts on storytelling, which is focused on repeating stories one hears. Experiences today – as in warfare – are increasingly traumatic, and people return from them grown silent, rather than richer in stories. Humanity seems to be cast about by powerful, inhuman forces (modern technology or the statist regime of fate). Furthermore, experience has become less communicable. People cannot receive counsel because they cannot tell stories themselves. Benjamin sees this dying-out as a side-effect of secularisation and productive forces. It corresponds to a new beauty visible in what is vanishing. The decline of artisanal production also produces a decline in the idea of eternity, and a change in the relationship to death. On the one hand, death is hidden from view. On the other, experiences become transmissible only on one’s death-bed. The rise of the novel is part of the long decline of storytelling. The novel depends on the book, as a technical form, and on the rising bourgeoisie as its readership. Whereas storytelling (even if written) exudes companionship, novels suggest isolation. Novelists are unlike storytellers because they isolate themselves from the readers. Novels do not counsel. They express the incommensurable. Novels usually focus on one hero or event, whereas storytellers recount many. Citing Lukacs, Benjamin argues that the novel only becomes possible when people are separated from their ‘transcendental home’, instead seeing the unity of a life through time. The ‘meaning of life’ replaces the ‘moral of the story’. There is a tendency for the past and present to be reduced to what is remembered. Readers hope to obtain meaning from a novel which they cannot obtain from their own life, since it is incomplete. Benjamin argues that information now brings crisis to the novel, as much as to storytelling. Information is focused on understanding clearly what is nearest. Unlike stories, it is verifiable. The spread of news and information contributes to the loss of storytelling. Events rarely benefit storytelling because they are already shot through with explanation. This discussion has interesting implications in terms of the construction of non-essentialist cultural forms. It is informative to cross-read Benjamin with James Scott’s studies of peasant culture, in which folk tales are one of the ways in which the ‘little tradition’ and ‘hidden transcript’ are conveyed. One could also cross-read this discussion with the question of stories in indigenous traditions, which often create dense relationships between a form of life and aspects of the environment. The Aboriginal idea of dreamtime, a zone of origins at once cosmological and initiatory, has general relevance as the zone of affect in which stories occur. One can also cross-read Benjamin’s work with the re-reading and montage involved in theatre of the oppressed. However, there is also the question of the effects of the usurpation of storytelling functions by film and television. What happens when the storytelling spirit is rekindled, but tied to the spectacular, aestheticising processes Benjamin views as fascistic? In an early text, “The Author as Producer”, Benjamin argues that a correct political position implies a particular literary position. Literature is not something which relates externally to relationships to production, but a particular aspect of relations of production. Intellectuals are simply a particular sub-type of productive worker. It is thus a mistake for writers to only support the proletariat ideologically, rather than as an artistic producer. Intellectuals reproduce capitalistic divisions by simply standing alongside the proletariat, as if their own activity were not productive work. Furthermore, they reproduce the forms of bourgeois culture, hence retaining at the level of their work a solidarity with the bourgeoisie. Artists and authors should seek to transform, rather than transmit, the apparatus of cultural production. For instance, Benjamin criticises realistic photography for making misery an object of pleasure, simply reflecting rather than renewing the world. Benjamin criticises the positions of elite artists whose radicalism is entirely at the level of content, rather than form. According to Benjamin, literary energies should be applied to forms of popular culture such as designing posters and writing popular newspapers. The boundary between author and audience is already beginning to disappear. Cultural practices should seek to further transcend the division between artist and audience. Production, rather than contemplation and consumption, should be central. Art should have an organising function. At this stage, Benjamin is still quite orthodox in his communism, and celebrates the Soviet tendency to deny individual creativity as a value. In various texts, Benjamin argues that artists should be involved, not in artistic careers, but in the creation of political imagery, even at the expense of their art. He also argues for exhibitionism as a response to petty-bourgeois privacy. He also holds up Brecht’s theatre as a model, and the practice of montage. Mainstream theatre is simply amusement (or spectacle), a product of the ‘satiated’ bourgeois strata. In contrast, revolutionary theatre should not aim to fill the audience with emotions. It should seek to make people consider their life-situation. It should have a dehabituating function. In One-Way Street, Benjamin argues that art is needed to fuel alternative beliefs. The present world is constructed from the power of facts, not convictions. Furthermore, the present facts are such that they rarely become the basis for convictions. In this context, literary work cannot remain purely literary. It must aim for and alternate with action. The favoured literary forms of such a moment are not books, but pamphlets, placards, articles – all written in a ‘prompt language’ equal to the present. Opinions must be applied sparsely, like oiling a machine. Another early text, “Rigorous Study of Art”, is a critical examination of an edited collection of cultural criticism which foreshadows Benjamin’s own work. Here, Benjamin argues that it is often the inconspicuous aspects of a work, rather than its spectacular aspects, which are important for research. Such a study is able to wrest meaning even from apparently worn-out texts. He also writes of the importance of being able to ‘be at home in marginal domains’. This, for Benjamin, represents the future of the study of art. Benjamin’s view of criticism also suggests a particular cultural politics. The critic both unfolds the inner meaning of a text and ‘ruins’ its outer beauty. Benjamin’s literary and artistic criticism takes the form of immanent critique. It closely reads a text while also situating it in a historical context, and drawing out meanings for the present day. He locates texts within a particular perspective or worldview: Goethe is in the world of myth and fate, Baudelaire is allegorical and connected to urbanising Paris, Trauerspiel reflects particular issues of modernity. The art of the late Roman period was going through a transition from haptic (touch-based) to optic (visual and spatial), which culminated in modernity. In ‘A Child’s View of Colour’, Benjamin suggests that children also draw pictures on a haptic level, unconcerned with depth or three-dimensional imagery. He also suggests that colours in artworks function according to their relations, and that lines are effects of the meeting of colours. a quite interesting, and in fact illuminating chapter of Benjamin’s most critical work. I appreciate this choice out of his work.